The way to get it wrong is by burning yourself out. I’ve seen it happen to the best of us. There’s no vacation time from parenting, you are in it for days, weeks, years, sometimes sleep deprived, most times running on empty. You search for the exits but there is no escape and then you feel guilty for wanting to escape at all. Well meaning people love to give new parents advice but most of it is about co-sleeping or breast-feeding. You’ll also hear about “your instincts,” and “knowing exactly what you’ll need to do.” There’s never any advice if your baby is colic and does nothing but cry for 6 months straight. No one tells you what to do when you turn into a zombie who would just as soon eat her crying baby as rock her gently back to sleep. The first year of life with your child is the best and worst, lots of sleepless nights but so many snuggles. You want to spend every moment watching and loving them as best you can. So much so that it seems nothing else exists, it’s all-consuming and this is where the burn-out begins. Get a hobby: I spent a lot of time on bed rest when I was pregnant with my son. It was very frustrating and there is only so much daytime TV that can keep you occupied. My cousin bought me some needles and yarn and I decided to take up knitting. I am really glad I did because I found it to be very therapeutic. Knitting might not be for you but you should find something that is. Scrap booking, jewelry making, baking, or anything that makes you focus on something other than your kids. Make grown-up time a priority: For the first few months of your baby’s life you will have no time for grown ups. Eventually though they transform from helpless infants into terrible toddlers who will insist on watching Teletubbies or Barney or whatever on loop forever. This will make your mind mush and drive you to the brink of insanity. At this point I recommend you call up grandma, grandpa, or auntie to sit on your kid(s). Then invite some close friends for dinner and drinks. A few rules, refrain from talking, thinking, or bragging about your kids. Take a break, a total break from being a parent. Talk about your frustrations: Every parent wants to drop their kid(s) at grandma’s house and never return at least once during their parenting journey. Any parent who denies this is lying…I don’t care what they say…they are lying. I wish someone would have told me this because when I had these feelings I felt tremendously ashamed and wondered when the total bliss was going to kick in. So I spoke to my pediatrician about these frustrations and he told me they were normal and reminded me that there is no perfect way to parent. The moral of the story is talk to someone you trust and you’ll feel better about it, I promise. Unplug and have quiet time: I’ve talked about feeding your body and your mind but now I want to talk about feeding your soul. At the end of the day, after your umpteenth meal, or bottle, or episode of Spongebob, when your precious little angel-devil is finally fast asleep, stop and soak up the quiet. Don’t check your email or log into Facebook, don’t call a friend and don’t turn on the TV to veg out just yet. Unplug yourself from the world and just sit in peace and quiet, breath deeply, clear your mind of doubt and be by yourself for a little while. 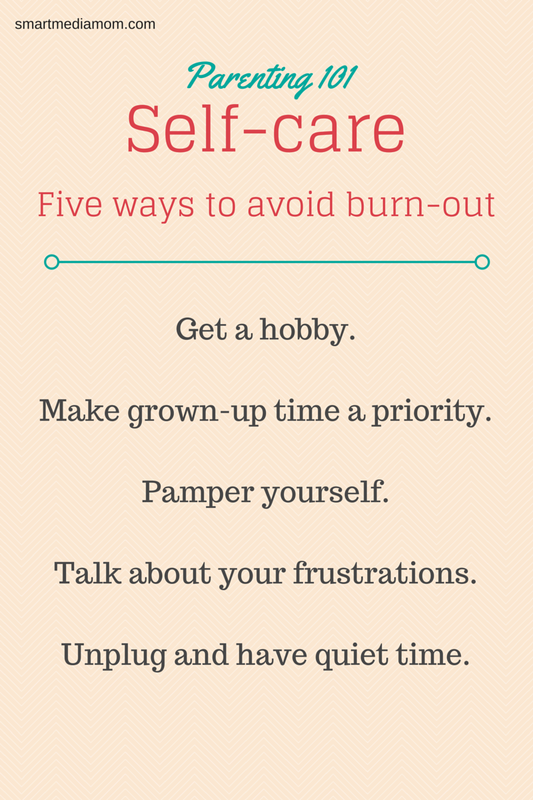 Self-care requires prioritizing yourself and doing so will help you prioritize everything else. You are important, so put yourself on the list and work just as hard at self-care as you do at caring for your loved ones! Omg!!!! Thank you, about to have a new baby and in already feeling burnt out because I have a 3 year old as well and it’s conversations with him all day, cartoons and his dinosaurs. Lol I really needed these tips. ← What does a Modern Feminist Look Like?